I’m at my in-laws place in California still, as my husband and I are packing up his things to move them up to Vancouver. However, as he has to do most of the work of sorting through boxes, I am free to create. On the drive down I picked up 2 100% cashmere sweaters and one 100% Italian merino sweater to recycle. 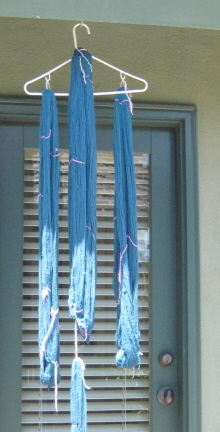 Here are the yarns, in progress. I put together a makeshift niddy-noddy, as I don’t have mine with me. I made it of a cardboard shipping tube, with chopsticks punched through at top and bottom. It worked well until one of the chopsticks snapped under the pressure of springy cashmere. 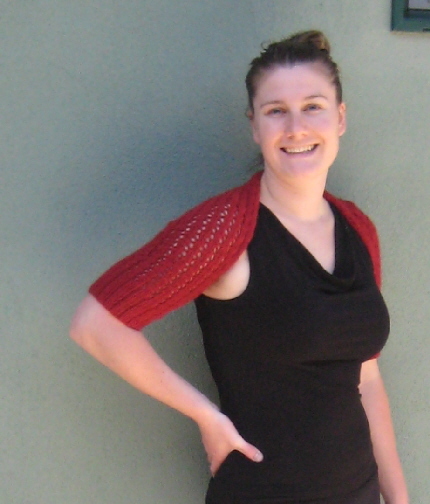 I’ve also finished (or mostly finished…) the red angora/rayon lace shrug that I started last week. It was a very quick knit. I’m not sure if it’s 100% finished as it is, or if I will pick up and knit a ribbing collar/band around the neck/back opening. I’ll give it a bit of time, and once I’ve decided it’s happily finished, I’ll post the pattern. 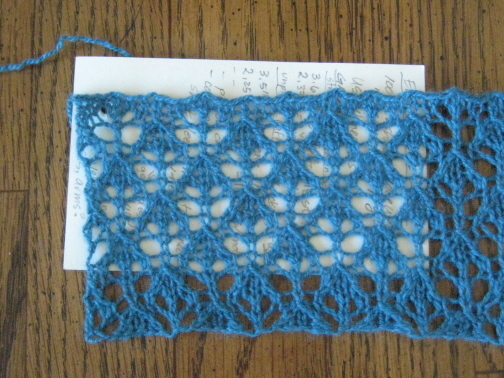 With some of the cashmere lace I’ve reconditioned, I’ve knit a swatch of ‘English Mesh Lace’ – below is the swatch pre-blocking, during, and after blocking. Using US#4 needles, it’s coming out to about 5 sts/inch. 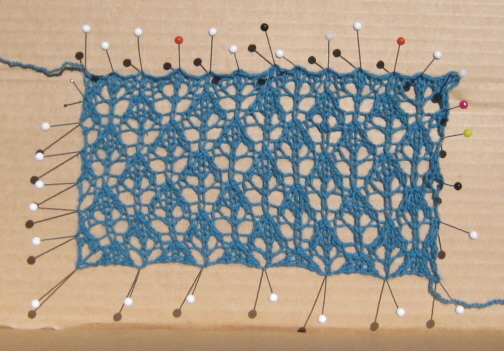 This stitch pattern is a very easy lace pattern, which really has only 2 distinct ‘lace’ rows, which are offset, and all WS rows are purled. I’m very impressed with the effect you get from such a simple pattern. 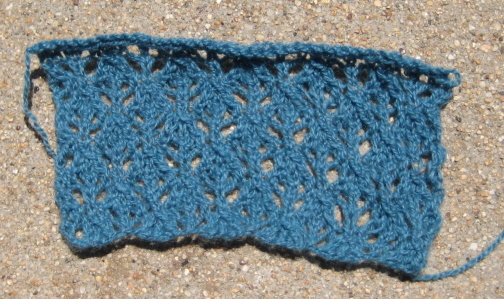 I’m thinking I’ll make a tank or shell with this cashmere lace, though I’ll be dying the yarn first. Wow, I LOVE this shrug!!! I’ve been dreaming of something like this for years. Would love it if you could post the pattern! Your shrug looks very pretty and I really like the lace swatch. Good luck moving your husband’s things!